As the 2018-19 season gets underway, the Bulls, Blackhawks and United Center want to ensure you make the most of your trip to the arena. Below are a few key arena updates to make sure you have the best experience possible while visiting the United Center. Non-Event Hours: Monday-Sunday, 10 a.m. - 6 p.m.
*The atrium will also be available for private bookings, which could alter operating hours. We thank you in advance for your cooperation and look forward to seeing you at the United Center! All official United Center parking lots are conveniently located near the arena and can be accessed from Damen Ave., Madison St., Adams St., Warren Blvd., Wood St., Monroe St., and Washington St. 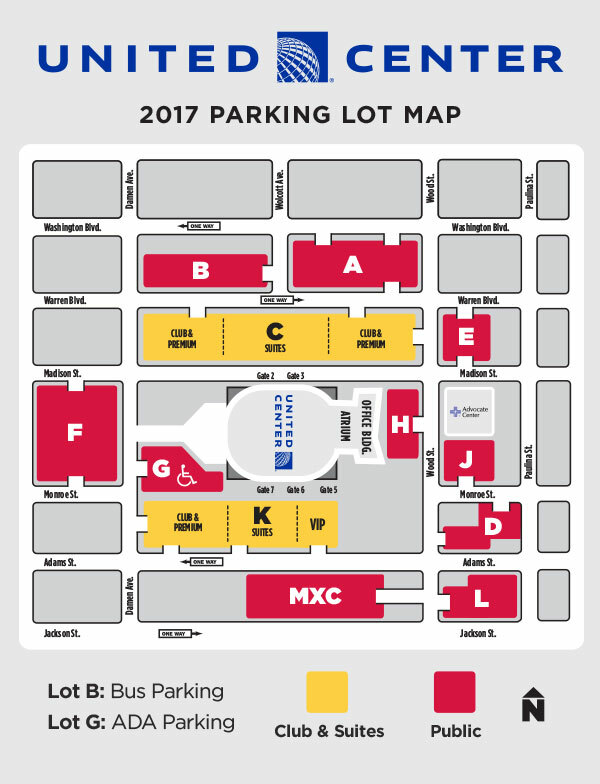 Please refer to the parking map below for updated information on VIP, Club & Suite, and general public parking. For more information regarding Directions & Parking, please click here. To better accomodate our fans, our new concierge-style Box Office located in the public atrium is now fully operational. Tickets left at will call will be available for pick-up at the Box Office located in the atrium. The newly renovated Box Office will also accommodate for customer service, advance sales as well as ADA sales. Guests will be required to walk through metal detectors at all entrances. Additionally, selfie sticks will not be allowed in the arena. First Aid stations are located on the 100 Level across from section 115 and on the 300 Level across from section 327. For more information regarding Security, please click here. Guests can enjoy renovated concession stands and new food and beverage offerings as part of “Chicago’s Plate,” the arena’s locally-inspired food and beverage plan. New dining destinations will feature some of Chicago’s best dishes from Big Star, Publican Quality Meats, Lillie’s Q and more, while longtime fan favorites, including Vienna Beef and Goose Island, will also return. For more information on Chicago’s Plate, please visit chicagosplate.unitedcenter.com. For more information on Chicago Pours, please visit chicagopours.unitedcenter.com. Plan your dining experience for your next visit to the United Center! - Non-Event Hours: Monday-Sunday, 10 a.m. - 6 p.m.
- The atrium will also be available for private bookings, which could alter operating hours.